Sales of trucks and passenger cars were both down as the number of new motor vehicles sold dropped 4.8 per cent in August. Statistics Canada reports preliminary industry data indicate new vehicle sales increased four per cent in September. Sales of trucks (which include minivans, sport-utility vehicles, light and heavy trucks, vans and buses) fell 5.2 per cent to 73,002 in August after four straight monthly increases. The agency says passenger cars sales dropped 4.3 per cent to 55,762. North American-built car sales dropped 5.7 per cent and were the main contributor to the decline, while sales of overseas-built cars fell 2.6 per cent. 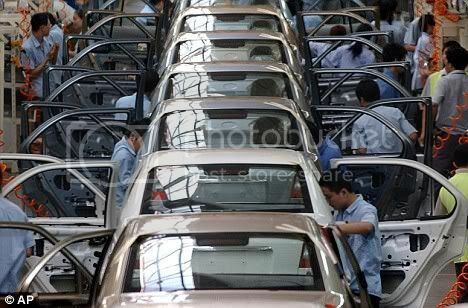 New vehicle sales dropped seven provinces in August. We are moving to a more greener society. People are fed up of high gas prices and inefficient vehicles. Expect this trend to endure for years. There are many factors to this decline. One being a cyclic and thus, expected activity that happens during the quiet August period. Nothing to worry. It is normal. Oh noes! We are in a recession! So where’s my cupie doll…i predicted this would happen back in July!